US 69 is a strange little outfit. They blended funk, rock, psych, and jazz together to make their own unique flavor. This is an excellent LP. Released on Buddah in 1969, birth year of yours truly, it's fantastic from start to finish. Even the finest psych Lp is rarely enjoyable throughout. The vocal stylings on this are great, as is the constant great lyrical references to plastic people and taking off of disguises. Other common fare of psych lyrical trends are here as well "making your mind up", and "open up your door". They were extremely experimental and one of several groups at the time blending rock with full horn sections. "I'm A Nobody" is an excellent fast jazzy groove that has a punk edge. It's a favorite of mine and just a tremendously killer track. I don't think I've heard anything quite like it before. A direct mirror of a track would be Gil Scott-Heron's "Free Will"
from his 1972 LP of the same name. 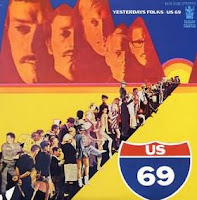 "Yesterdays Folks" is a tuff and funky blue eyed soul scorcher right out of the hippie funk and psych rock camps. It's fat breaks and outrageous lyrics will keep you on the edge of your seat. "I Hear You Talkin'" is a gentle and affecting tune, and greatly reminds me of the group Chicago. It also reeks of being in need of being sampled. Oddly mostly all the tracks on this LP have the 'sampled' potential and there's even a rumored DJ Shadow loop within. I'm not versed enough with his material to find it, but pleased none the less for the stamp of approval. Or, should I say "Samp" of approval. Bet you no one has coined that yet! It seems those LP's worth sampling are truly rich with texture. I find this a harmonious affair, because I like the 'odd', 'bizarre' and 'texturally rich' music like nobody's business. So, a well sampled or potentially well sampled Lp is what I'm after. My first encounter with "2069 A Spaced Oddity" was through a compilation of folk funk and breaks which I believe was under the same name. It's a stellar pysch trip and a long slow spaced out groove. Not only epic in size, it's completely genius and fantastic, as is the whole Lp which you can find here. At times they sound like an early Chicago and at other moments they sound like Gil Scott-Heron, which is a mighty impressive mish mash really. Yet, I think they predated both of those artists. Funny at times they even sound a bit like Kings Of Leon. I love finding exactly similar artists represented 10-20 years before. Like for example, The Cardigans and Blossom Dearie. Regardless, this is an above average psych LP with a lot of different directions represented. It's been reissued, which is good for you, but again adds to yet another story of me paying a pretty penny for something I HAD to have at the time. Not so good for me. I blame it on the compilation. But, be it a good comp or bootleg, it's totally worth it, sending you out in a manic fashion searching for something as golden as this LP. At that time, I NEEDED to hear what the rest of the LP sounded like, even if it only had one other gem. Enjoy! Cool writes! I found this album in a dump-store around 1982 and have been loving it 'to death' (literally) eversince. Thanks for your review and insight.